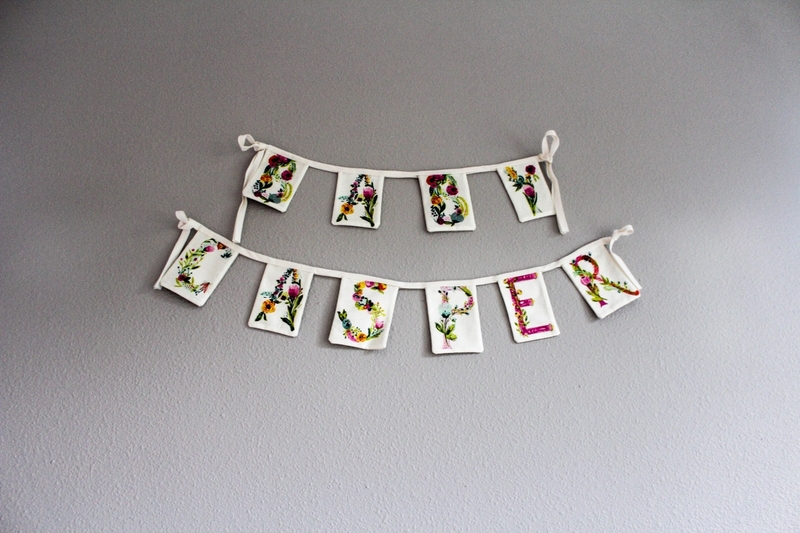 Are you hosting a gender neutral baby shower and looking for rustic baby shower ideas and decorations? Do you want it to be a perfect party for your family or friend and want them to feel special on their big day? Well, then you’ve come to the right place. 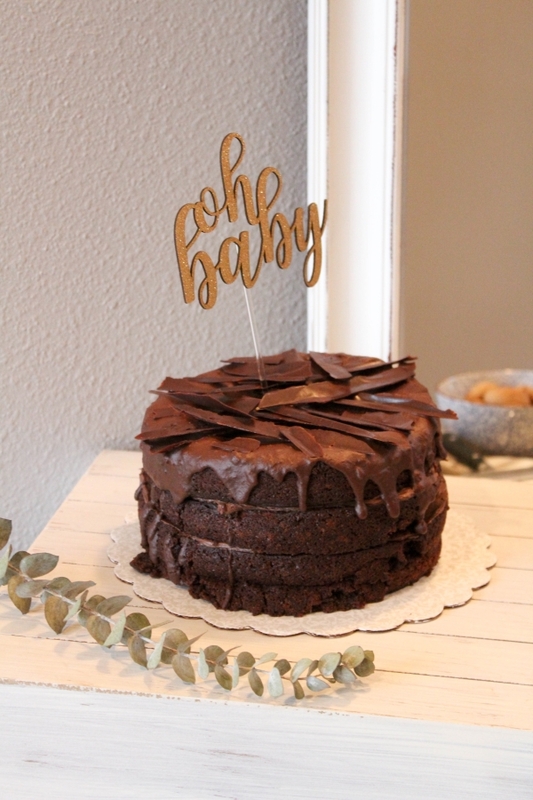 I’ve outlined 17 of the best rustic baby shower ideas and decorations with an elegant greenery themed touch. 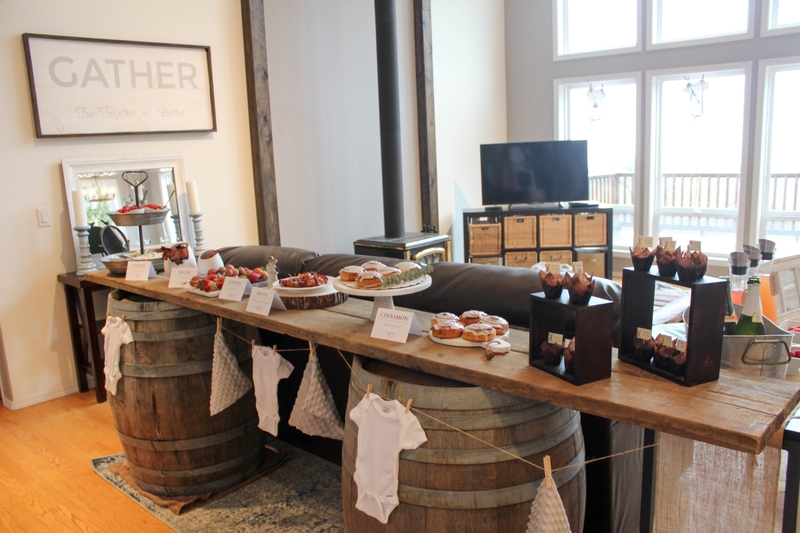 You are sure to impress your guests with the following baby shower ideas and games. Have I mentioned that I love hosting? I truly enjoy bringing friends and family together to share stories, create memories, and of course, tell a few lies. One of my closest friends recently moved here to Oregon and is about to have her first baby. Her mom is hosting a baby shower for her back home out of state, but I wanted her to be showered by all the friends she has made since moving here to Oregon. So I’m hosting a gender neutral baby shower since they aren’t finding out the gender. I decided to go with an elegant greenery theme with a few copper and gold elements as well. 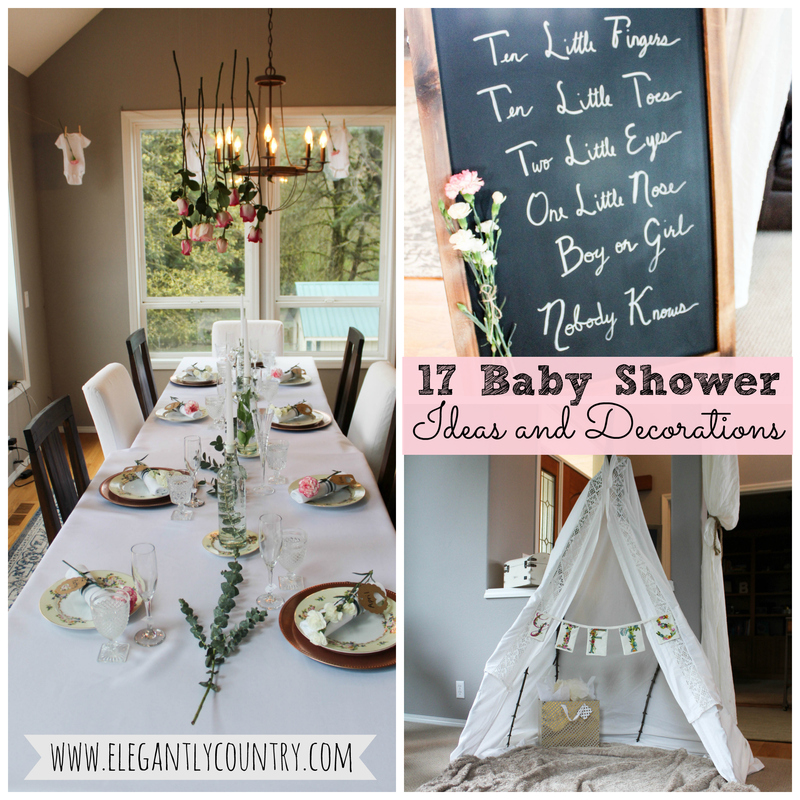 I hope you enjoy the following rustic baby shower ideas and decorations! 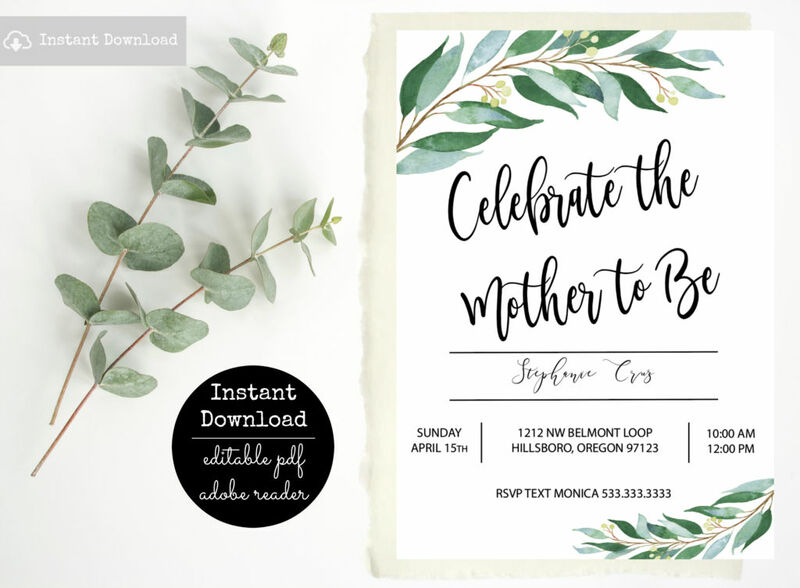 First, I started by creating these beautiful baby shower invitations with some elegant greenery that are editable. 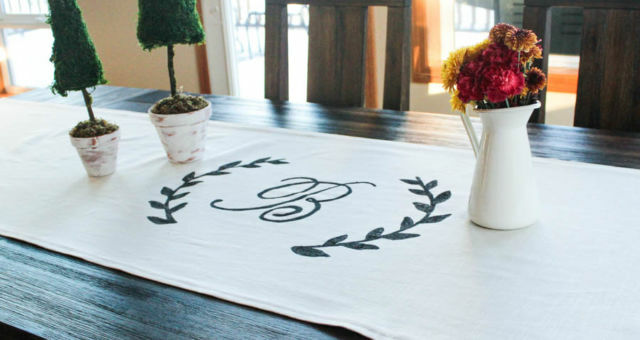 Start by adding an elegant white tablecloth to brighten up the space. 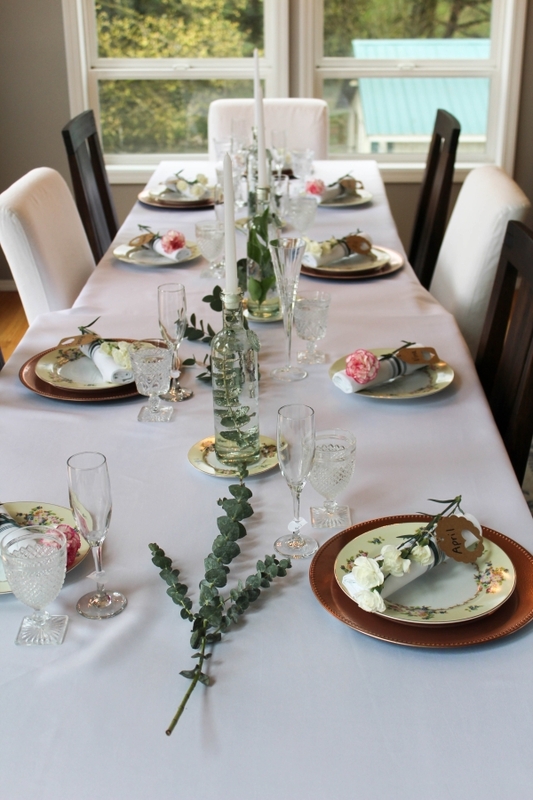 Then place down rose gold plates under every other plate to add a pop of color. Next, add your vintage fine china on top of the copper plates. For the napkins, I rolled them and added name tags along with a flower. Then for the water glasses, I used vintage goblets for a fun touch. 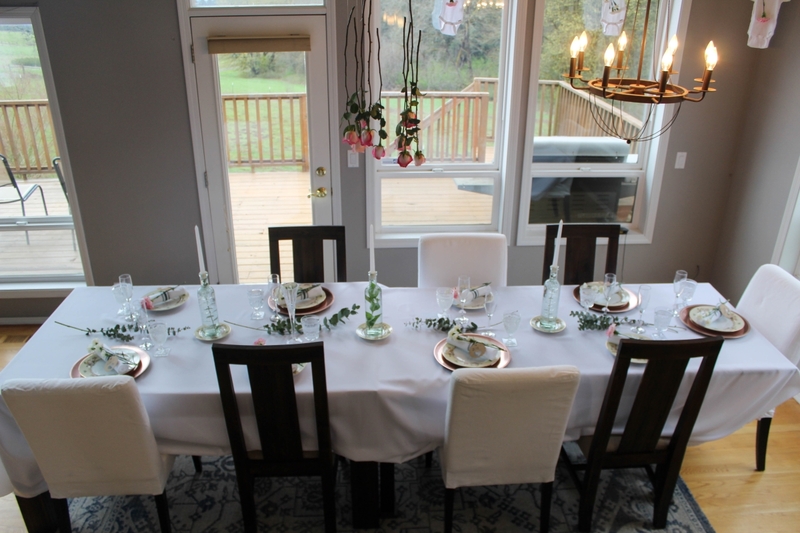 For coffee or tea, I used the matching vintage coffee cups and saucers that went along with the brunch plates. Don’t forget to add your silverware. 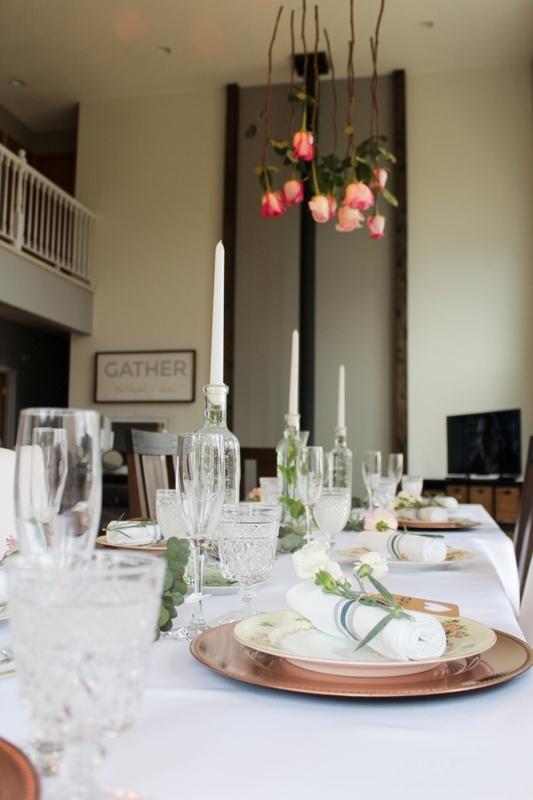 For the centerpieces, I began with using greenery as a table runner. 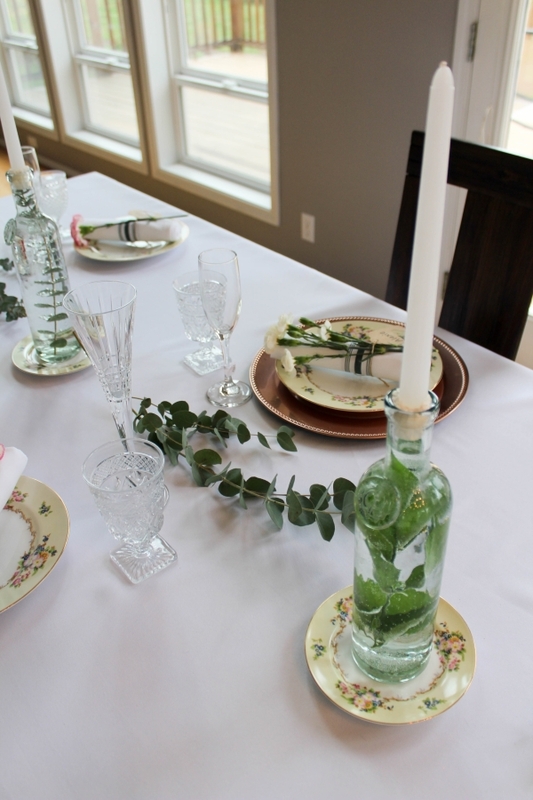 Next, I found old clear bottles, filled them with water, added some greenery inside, and added a white thin candle on top, and placed it on a vintage saucer plate just in case the wax started to spill over. For my table decor statement piece, I decided to create a baby mobile with greenery and flowers to hang over the table for a fun show stopper. 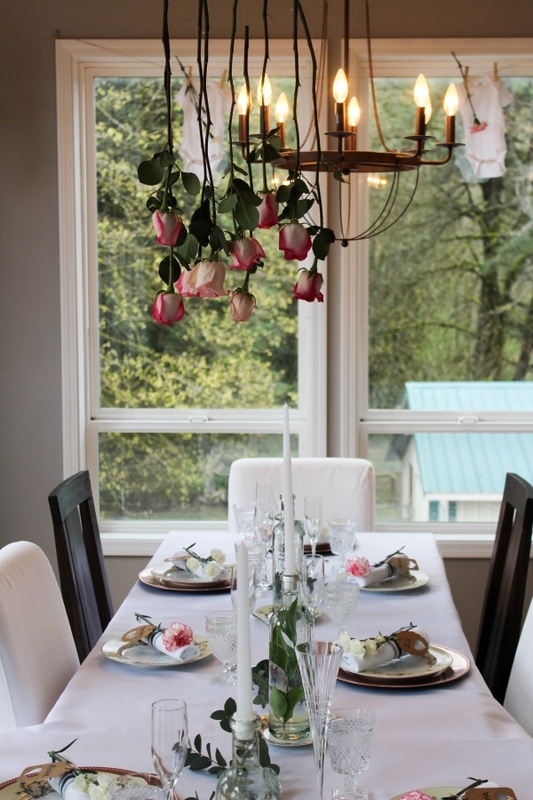 I love the look that mix and matching chairs can add to a table decor. Don’t be afraid to give this one a try. 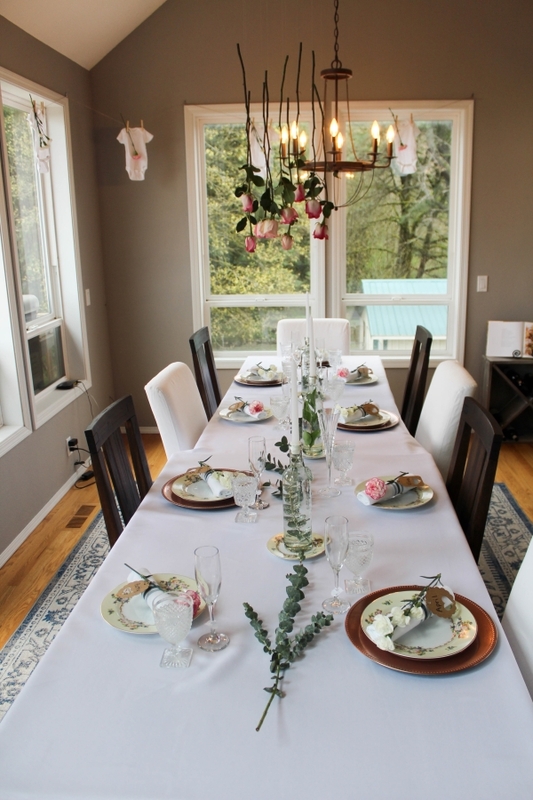 Brunch is a fun and easy food option for a baby shower. There are many brunch foods that can be made or prepped ahead of time as well as store-bought ahead of time. Display your food on top of wine barrel tables. I used two wine barrels that we used at our wedding for our cake table and placed two old boards on top to set up our food display. 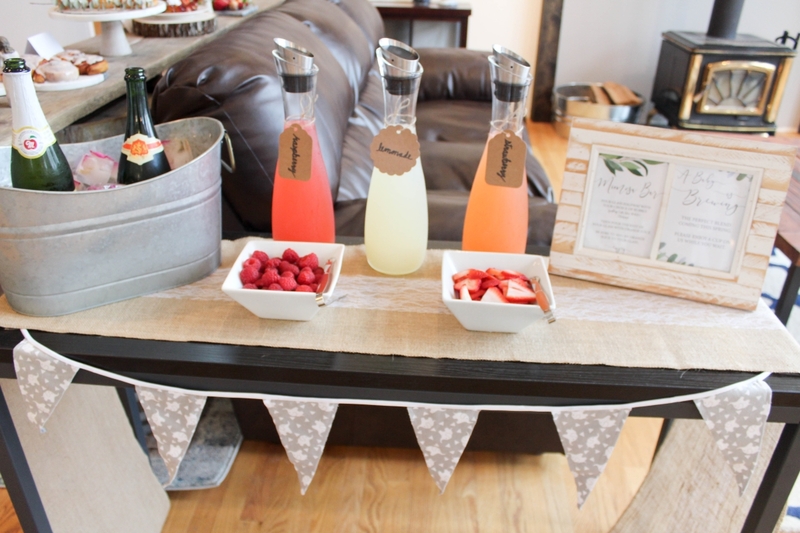 Create a fun and exciting mimosa bar. I created a fun sign for how to build your mimosa with or without alcohol. 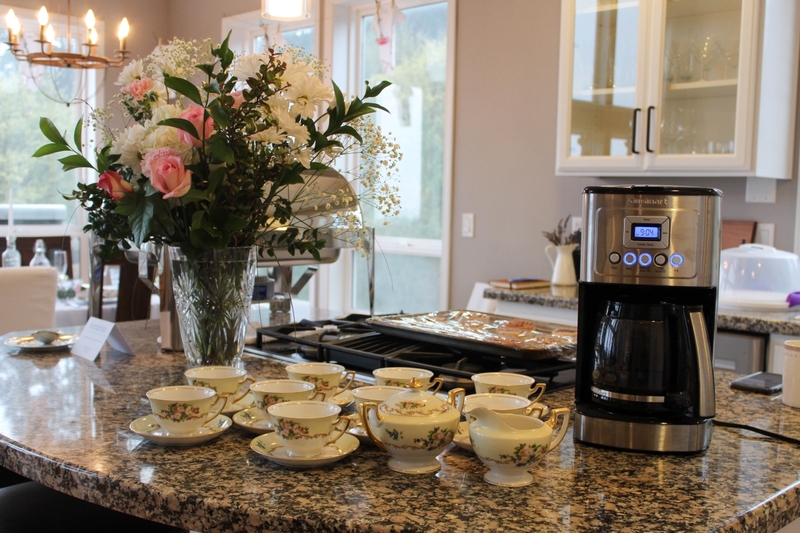 Since I was hosting a brunch I figured I should also have a coffee and tea bar along with the mimosas. 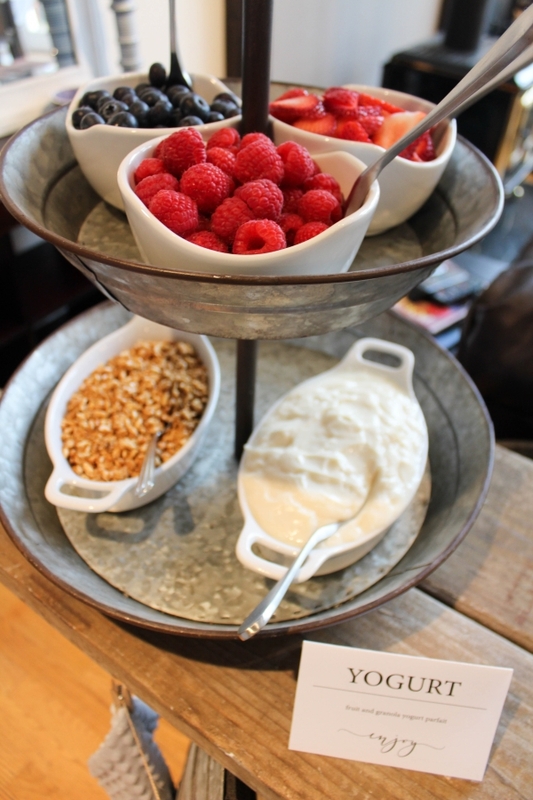 You can’t forget about a dessert table! I wanted to create a naked cake you know the kind without much frosting around the outside. I found this amazing recipe and made this chocolate cake. Don’t forget your cake topper and napkins. 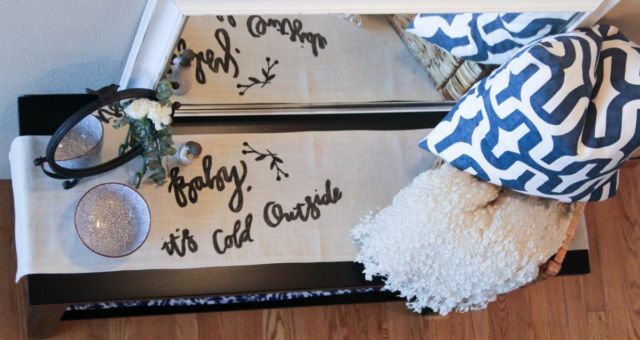 Create a fun and elegant place for guests to place their gifts for the mother-to-be. I created this canopy with some sticks from the yard, old curtain fabric, and some twine. 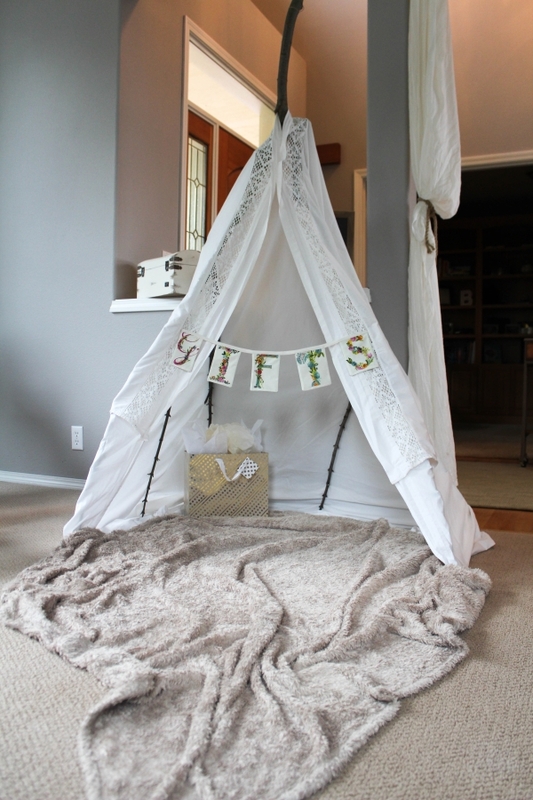 Next, I placed down a blanket to give the space an inviting feeling. 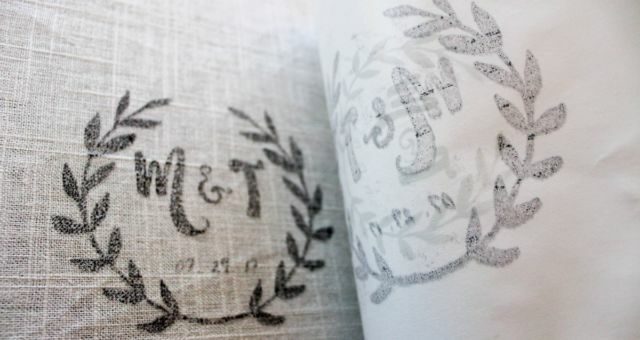 I found this fabulous letter fabric that I used to create different banners. With only 1 yard of fabric I was able to make one for “gifts”, “oh baby”, and one with the babies soon-to-be last name. Don’t have time to create your own banners? You can also buy them custom made. Grab the comfiest chair in your house for your mother-to-be to sit in while she opens her gifts. Feel free to dress the chair up with a blanket or pillow. Don’t forget to play some baby shower games. 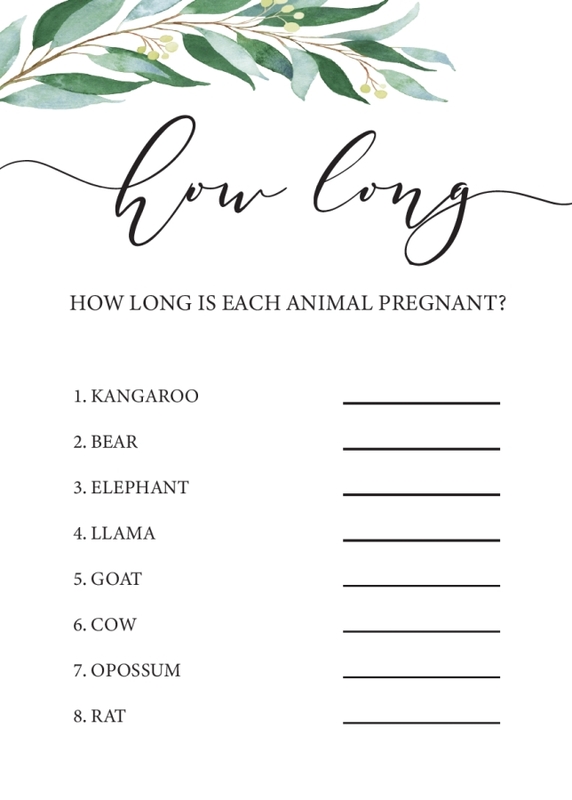 We played “The Price is Right” game and a “Guess how long each animal is pregnant” game as well. I used clipboards to make to easy for everyone to write on. 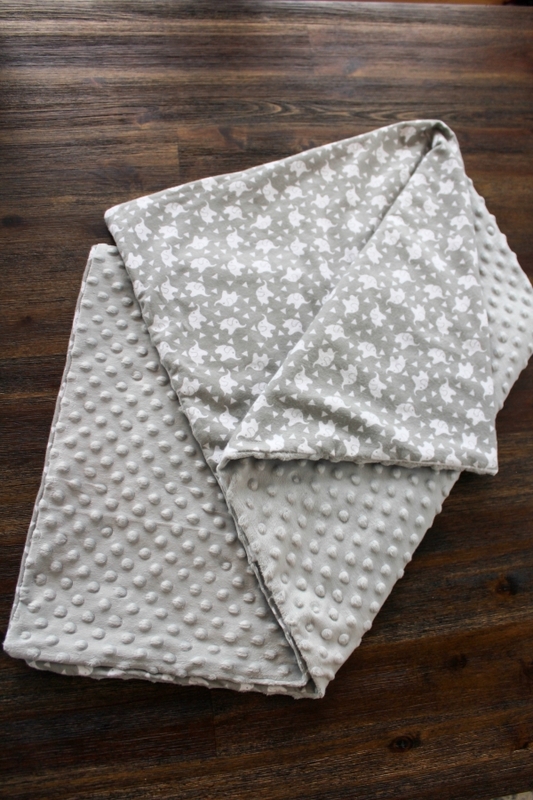 Create a handmade baby blanket as a gift from you! 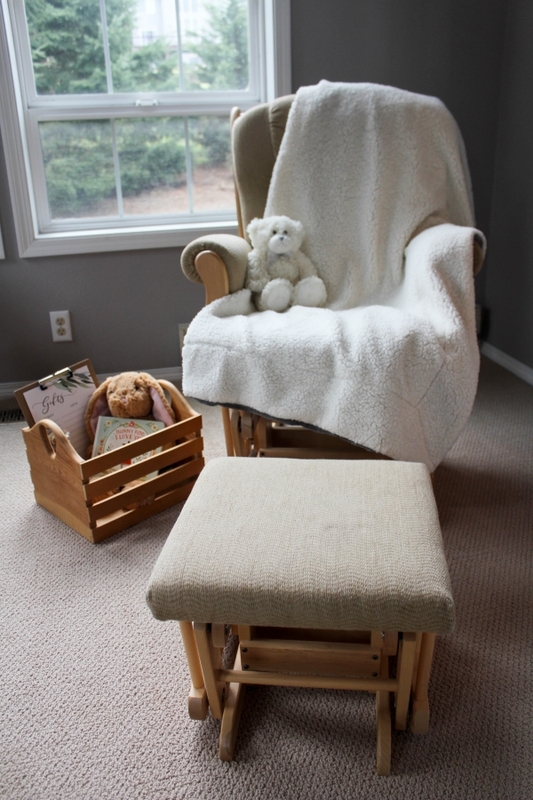 Find out what colors or theme the mother is using in her baby room and use that as inspiration to make your blanket. 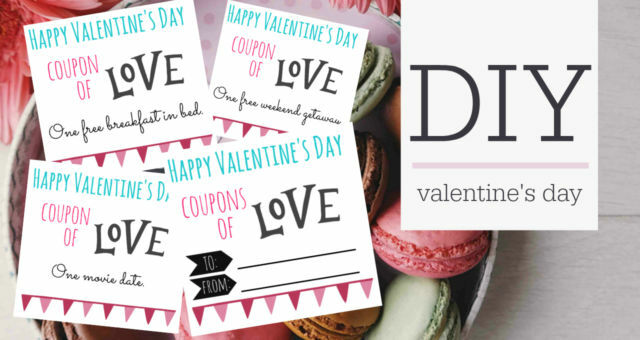 She’ll love such a thoughtful gift that was made by you! Make sure you have someone keep track for the mother-to-be of all the gifts she got and who to thank. In addition, I also gave the mother-to-be matching themed thank you cards along with envelopes and staps as a fun touch so as a new mommy she didn’t have to add another thing to her plate. 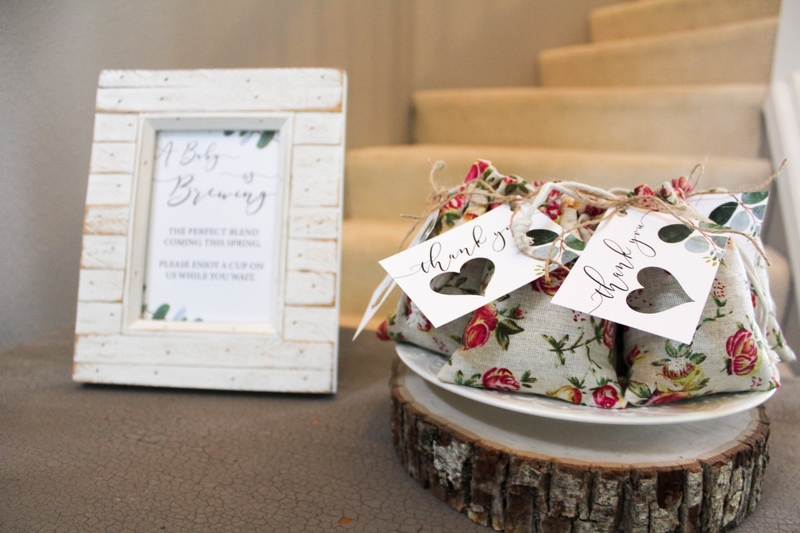 For my baby shower party favors, I put whole coffee beans inside of these cute pull string burlap bags and added a fun sign to encourage everyone to take a party favor home with them. Start planning your baby shower today. 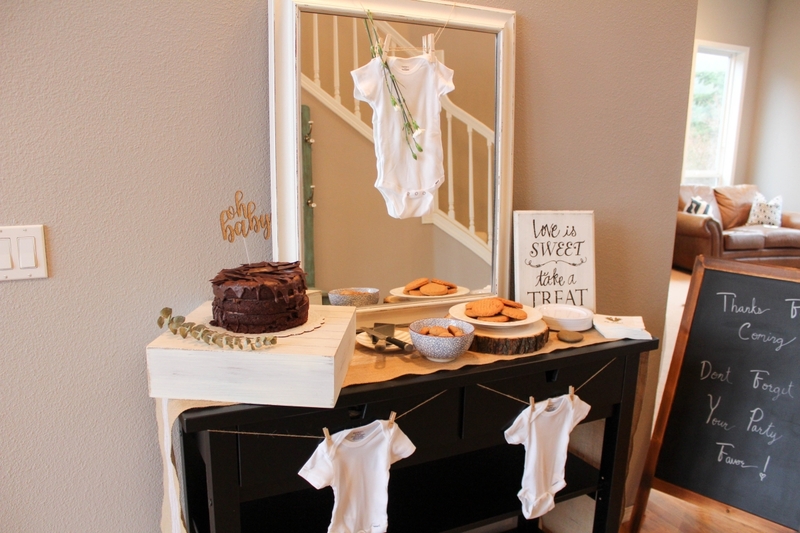 Pick out your favorite rustic baby shower ideas and decorations and get started making those ideas come to life. 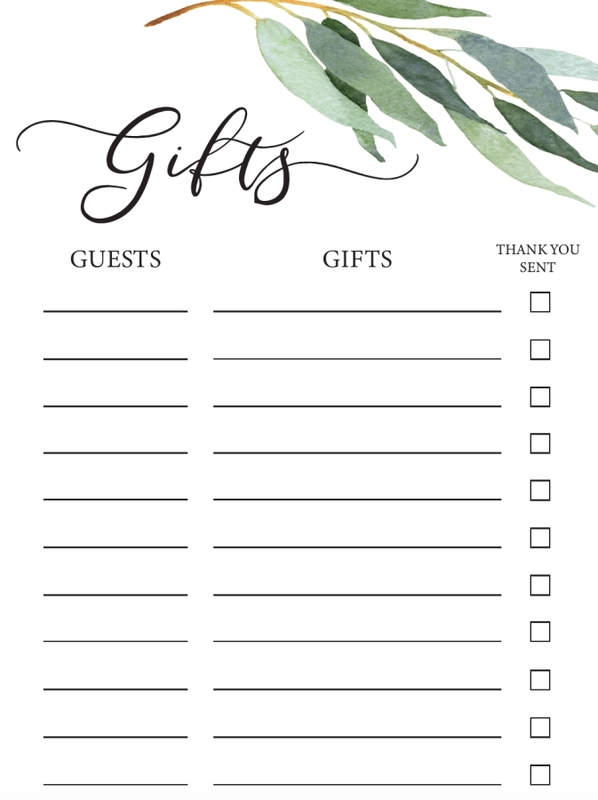 You’ll surely impress your guests and your mother-to-be will feel very loved with all your thoughtful touches and details that went into your design. I can’t wait to see what you come up with. Enjoy your free baby shower games by downloading the free games below. Be sure to check out the matching baby shower invitations. 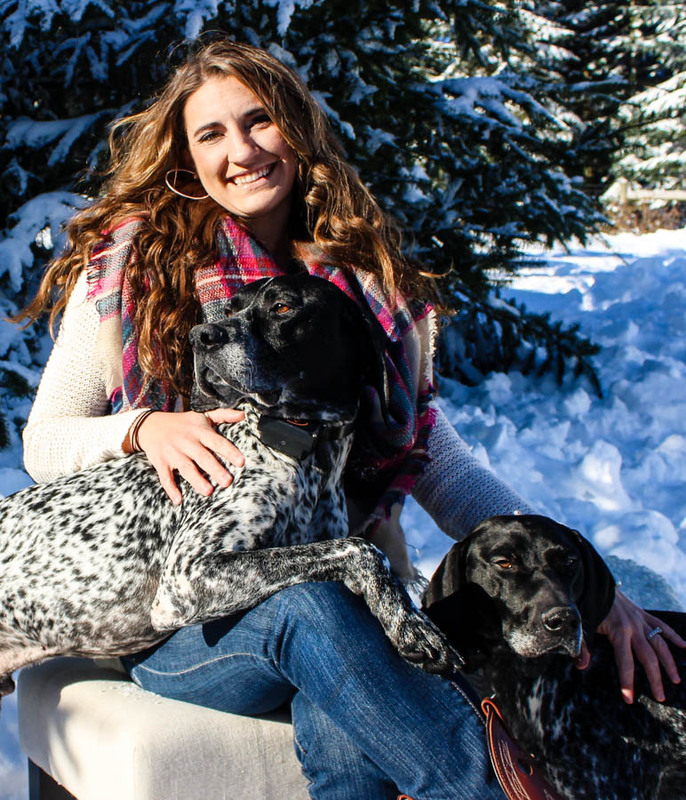 I'm a speech-language pathologist by day and a country girl, blogger, wife, cook, DIYer, avid Fixer Upper watcher, and mom (to two dogs) by night!